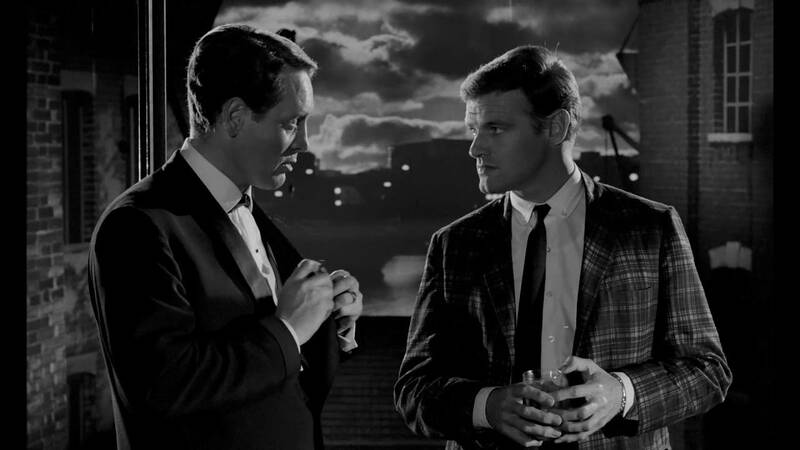 Basil Dearden has quickly become one of my favorite directors. From his subject matter to his wonderful cinematography ( in this case Edward Scaife), Bearden never fails to deliver a fabulous, if not perfect film. All Night Long is his version of Othello. Set in London it features Johnny Cousin ( Patrick McGoohen ) as the jealous drummer of bandleader Aurelius Rex ( Paul Harris). Rex is married to Delia Lane ( Marti Stevens). Keith Mitchell stars as " Cass ", Rex's best friend and band manager. Richard Attenborough plays Rod Hamilton, a wealthy music promotor who with the help of Rex's friends and wife, throw him a surprise wedding anniversary party. The plot features Johnny Cousin plotting to not only breakup the marriage of Rex and Delia, but to also come between Rex and Cass and take Delia on the rode with him while he fronts his own band. McGoohen does a excellent job as the villian here. Paul Harris is superb as the stable, charming and charismatic Rex. Cass is excellent here as the loyal friend. As the film goes along you see a transformation with both characters that is just astounding from how they were at the beginning of the film. Attenborough is superb as the laid back music promotor who tries and referees the whole dispute that goes down. As a Jazz Musician and a lover of noir, All Night Long has a special place in my heart. I'm a big promoter of the film with younger jazz musicians and fans of this music. While most don't know any of the actors in the film, if they are really into jazz they know most of the first rate musicians showcased. Thats FABULOUS. Its great that you are promoting the film like that. Its a great film. The jazzmen lend a authenticity to the film that takes it to another level. Its great also to hear you are a musician. I tried learning the guitar a couple years ago and would like to try it again, lol. Its HARD...LOL. I love the piano also and might give it a go once I can get the basics of the guitar down. Back to the film. I most likely would not have run across it if I wasn't such a huge fan of Dearden. I became a fan of him after seeing " The Pool of London" which i have reviewed here. It SHOULD have been a part of the Criterion set. I'm sure Criterion has a good reason its not. I saw " Victim" also which is included in the Dearden boxset. I have to review it. That's a well done trailer. The music really hits you!